From modern to rustic, these small home decorating ideas can help you to make the most of your space! When you’re decorating your home, you want to create a space that you feel comfortable and relaxed in. Often times, people see small spaces as cramped and crowded. However, not all small home decorating is a puzzle-like aesthetic that fits all of your belongings into a limited space. You want to maximize your space when you’re in a small home. This means designing every part of your home no matter what your design aesthetic may be. The base of any home design is your walls. They create the backdrop for any other design choices you make. You want them to be complementary, rather than overbearing. If you want to create a simplistic home design, lighter color palettes are a great background. They create add light to a small space making it feel bigger. Softer hues, such as lavenders and off whites, can keep your space from feeling like a basic white box. If you prefer a more luxe home design, dramatic accent walls are the way to go. Small spaces don’t have to mean simple choices. By adding a dramatic color, you can add luxury a small house. If a wall has windows or glass doors, the drapery is a great way to make your space feel larger. Vertical stripes, either on the wall or curtains, make the space feel longer. If you want a solid color, matching the curtains to your wall color can create a seamless transition. Depending upon the color, this can make your home feel like it has longer rooms. Not only does the fabric design matter, but so does your curtain height. When you hang your curtains at the top of the window or door, you are cutting off your wall. By hanging the curtains above the window, you are lengthening your space. This creates long lines that give the illusion of a bigger room. You can maximize your small house decorating by utilizing the walls to their fullest potential. Hanging décor is a great way to make the most of your small space. You are freeing up floor space, while not losing any of your design. For instance, by using wall sconces or a hanging light fixture, you are creating more room either on your table or floor. There are plenty of different designs and materials used for these light fixtures than can fit into your home design. Art is another way to enhance a small space. Strategic placement and grouping of art can create the look you want for your small house. It can be hard to find the proper storage for your small home. You want a calm feeling in your house, not the uneasiness that comes with a cluttered home. Small apartment organization tips can be applied just as easily to small homes! One way to create storage without closing off parts of your home is to use shelves over cabinets. This open storage design is gaining popularity in kitchens, but it can be applied to any room in your home. 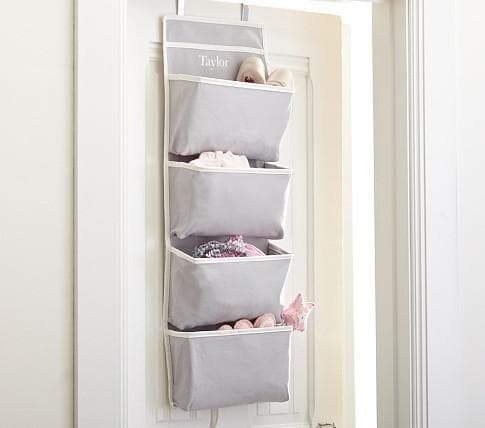 A clean display of your items is the perfect way to secretly store things as well. It may seem like a trendy design choice, but it’s all for a practical purpose. It helps to keep your small space light and open. If you have a second floor, consider using the space under your stairs. This is a great place for storage and is often overlooked. If you don’t want a standard closet under the stairs, think about different cabinets or shelves in the wall. It’s also the perfect place to fit a small desk for an at home office when space is tight. If your space is particularly tight, it’s time to use creative storage solutions. The first is to think vertically. Many people forget about the open space between the top of a cabinet and the ceiling. This is a great place to store things. It’s probably not best for commonly used items, as it is not the easiest to access. However, it can hold hat boxes filled with photos or extra kitchen settings and serving pieces. The backs of doors is another space saving storage solution. 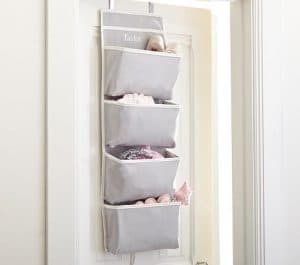 These spaces are perfect for racks of cleaning supplies or coats. This keeps them out of sight for the most part, but they are still easily accessible. Your furniture is the most defining feature of any home design. When you’re in the middle of small home decorating, you have to be more strategic than if you had ample square footage. Built in pieces are perfect for small spaces because they create room. By creating pieces that are a part of your home’s architecture, you’re not using the same square footage that you by having a standalone piece. Built in furniture is commonly found in the forms of a bench or shelving. 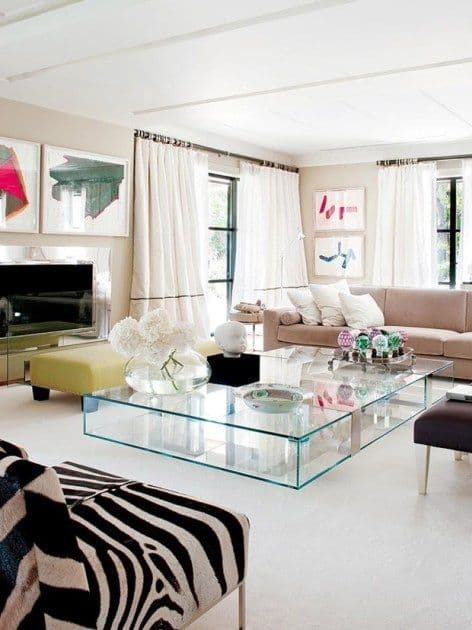 If you want to keep your space light and open, consider lighter pieces, such as acrylic coffee tables. Because the table is clear, it allows the pass through of light. It doesn’t create a barrier in the middle of your room. Round furniture, particularly end tables, are another design choice that can make the most of your small home. Round tables fill a space without having the definitive corners and ends that square or rectangular tables do. They fit more easily into small spaces and can be easily fit into a corner without feeling bulky. A popular approach to furniture in small spaces is to use bigger pieces, but have fewer of them. The large pieces fill the space. By using fewer pieces, you keep the space from feeling overcrowded. The most recent trend in small home decorating is multifunctioning furniture. By utilizing dual purpose pieces, you can make the most of your space. This could be a sofa that transforms into several seating options or a table with built in storage underneath. Once you have all of your walls painted and your furniture chosen, you have to fit it into your space. The final touches are want make your small space a home. Have centerpieces to your home to create a fuller design. For instance, if you have a second floor, a spiral staircase is a beautiful and functional piece that is the perfect addition to any home. Not only does a spiral stair have a much smaller footprint than a traditional stair, but it is completely customizable to fit your design needs. It has a sculptural quality that can be difficult to find in a straight staircase or a ladder, which is also commonly used in small homes. For smaller accents, add touches of elegance through fabrics and upholstery throughout your home. Small accent pillows are a great way to pull in color and patterns. Mirrors and metallic accents are commonly used in small homes as they make a room look bigger. A mirror’s image extends the room, making them common centerpieces above fireplaces. Oversized mirrors are also a trendy home design piece. If you want to keep the reflection to a minimum, consider small metallic pieces. When used in moderation, they can make a room feel more expensive. They also reflect light and create brighter spaces. If you want to add life to a small home, plants are the perfect way to do it. The green color is refreshing in the small space and they give a fresh look to any home. If you have a very small space, multipurpose rooms may be the way to go. By giving a room multiple uses, you’re able to keep an open floorplan without overcrowding the space. Much like the multipurpose furniture, you are creating a space that fits your needs. When placing your furniture in the room, leaving a few inches of space between the back of your furniture and the wall. This may not seem like much, but by adding the extra cushion, your room will feel much bigger. It gives the illusion that you have enough ample room to not fill it with furniture. An area rug can also make the space feel bigger if you choose the correct size. It shouldn’t fill the space completely, but rather overlap the furniture just enough to create a centered space. They key to creating a comfortable small space is to edit your design. Don’t feel as though you need to have all of your belongings on display at all times. By take a somewhat minimalist approach to your small home decorating, you’re allowing the space to feel more open. Small homes are often overwhelmed with lots of belongings or bare to avoid the clutter. If you find the right balance of decor, storage, and open space, you can create well planned space that is equally as beautiful. We've outlined some of the most popular ways to make the most of your small home design, but there are so many more out there!